Apple's iOS 9 update launched today, which is good news for iPhone and iPad users who are looking for the new operating system version - unless they can't install it. Like the iOS 9 became available at 10:00 PDT (San Francisco), 13:00 EDT (New York), 18:00 BST (London) and 03.00 AEST (Sydney, Sept 17), and, again, like clockwork, some people ran into problems. "Software Update Failed" is the current unwelcome error message greeting folks in the midst of downloading the software, reverting them back iOS 8. Like Siri, we're here to help. There are some simple tricks if you're running into this problem updating to iOS 9. 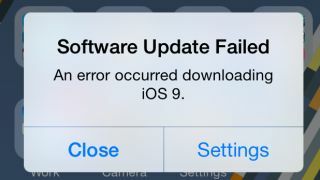 There are two ways we got around the "Software Update Failed" error message when updating to iOS 9 today. The first is try, try and then try again. Apple's servers are currently under a lot of pressure, rolling out today's operating system change to millions of iPhones and iPads worldwide. That's a lot of required bandwidth. The second solution is to go old-school by manually downloading the software to your phone or tablet. This requires a USB lightning cable, a computer and iTunes. Yes, you have to boot up Apple's old music software, the one that isn't Apple Music. Manually updating to iOS 9 always works better than over-the-air updates when I have problems getting the fresh coat of paint for my iPhone and iPad. It's the best fix to get your iOS 9 fix right now if you're getting that non-fatal failed update error message.